Disclosure: Our vape reviews are based upon the experience, testing and skill of our trained paid staff. Links from VapingDaily.com to one of the reviewed products or brands, will allow you to purchase directly from the provider. We receive commissions from these providers; this does not affect your price and helps to pay for the operations of this informational website. To learn more click here. Thank you! 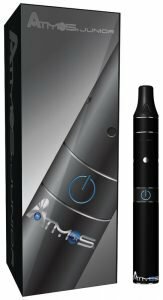 The Atmos Junior is a sleek vapor pen that has the ability to vaporizer wax/oil concentrates and even dry herb if you want to try it. It’s built mainly for the concentrates and it does a very good job of it, especially for the price. We know not everybody has time to read our full reviews. So here is a quick category by category breakdown of the Atmos Junior followed by a quick synopsis. 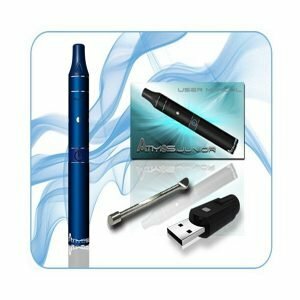 The Atmos Junior is a great multi-purpose vapor pen. It’s not get with dry herbs but it gets the job done. Disclosure: We receive a small commission if you buy the reviewed vaporizers using the provided links. This helps us to maintain this website. The Raw was already rather small, but the Junior beats it out by being several inches smaller. It’s still about the same width, but honestly we wouldn’t want it any thinner. The unit looks like a small flashlight, and it can easily fit into your pocket. It’s small enough that it becomes very portable but not so small that you feel like you are going to break it easily or lose it. Some changes have occurred to the design when compared to the Raw, the most noticeable being the ceramic heating chamber. This is a great change, and we’ll talk a little bit more about it later on. The Junior is designed to work with waxes and dry herbs. If you use the waxes you can just dab it into the ceramic heating chamber. The chamber isn’t very deep, but it doesn’t need to be. You can get about six good draws from a dab, and it is easy to place it in the shallow chamber. The ceramic chamber manages to burn up all your wax without leaving behind a gunky residue, so that was a nice bonus for those of us who don’t like to clean our vapes very often. If you use it with herbs, you need to put in a little mesh screen. This cuts down on how much space you have for your actual herbs, but it is necessary. The unit turns on with the press of the power button, which will light up when the vape is in use. Once it is on, you hold down the power button to heat up the coils. It takes about five seconds to get a good enough vapor built up for a draw. If you find that you aren’t getting enough vapor after a few seconds, then just hold down the power button for a bit longer to let it build up enough vapor. You may have to do this for herbs as they take longer to vaporize. The battery life isn’t as good as it was on the Raw. This is due to a smaller battery which has to fit in the constricted space of the Junior. It takes eight hours to charge the battery fully the first time. After that it will take between one and two hours and give you a little under 45 minutes of charge. This vape is seriously good at working with your waxes though. It is so nice that it burns clean through them and leaves nothing behind. Dry herbs are another story, and it was inconsistent when we tried to use them. We wouldn’t really recommend this as a straight dry herb vape. But it really can’t be beat when it comes to waxes and oils. And it is very secure so you don’t have to worry about it leaking in your pocket and making a mess. You might think every vaporizer pen manufacturer would make sure their product can do that, but you might be surprised at how many will leak when you carry them around with you. It also heats up super fast. In seconds, you can have an awesome hit and some great vapor production. That makes it perfect for taking on the go and pulling out when you just need a couple draws really quick. The Atmos Junior really has a problem vaping herbs. You can still use your herbs, but they won’t always vaporize like they should. If that is all you plan to use the unit for, then you should just pick up something else. But it is an exceptional wax vaporizer. And for its $80 price point, you get a quality vape that will continue to perform for a long time. Really, if you want to vape waxes and oils, you cannot go wrong with this. The herb users are going to be unimpressed, but for everyone else, it’s a good deal and a quality product. The FocusVape Pro is the update to the FocusVape that now features a silica gel body that is ideal for portability and durability. Read our review here. The Boundless CFV is an upgrade the Boundless CFX and this unit features an all-convection over and great portability. Read our review here.